The end lower point of our nose is called "tip" and the surgery for reshaping of tip area of the nose is called "Tipplasty or Nose Tip Plasty". The tip section is a very important area in the face view and the general appearance of the nose. The deformities in this region can be very quick. There are so many techniques about nose tip aesthetics. in some countries some of these techniques can be more popular. After the rhinoplasty and nose tip plasty operations, if the cartilage support in the nose tip region cannot be achieved sufficiently, the operation may be followed by sagging down the nose tip and the long nose and nasal congestion. Droopy nose tip can be seen after previous nose surgery, nose tip lifting or revision nose tip plasty operation and treatment of this problem is need to revision nose tip surgery with additional cartilage graft such as rib cartilage. In patients undergoing nose-tipping with only suture techniques, the risk of the emergence of droopy nose tip after the procedure is higher than the norm. In the above photograph, a patient who had undergone rhinoplasty operation 2 years ago and had a nose tip sagging a few months after the surgery, has been seen before and after the revision nose tip plasty operation. The more interventions are done with the anatomy of the nose, the greater the likelihood of postoperative problems. 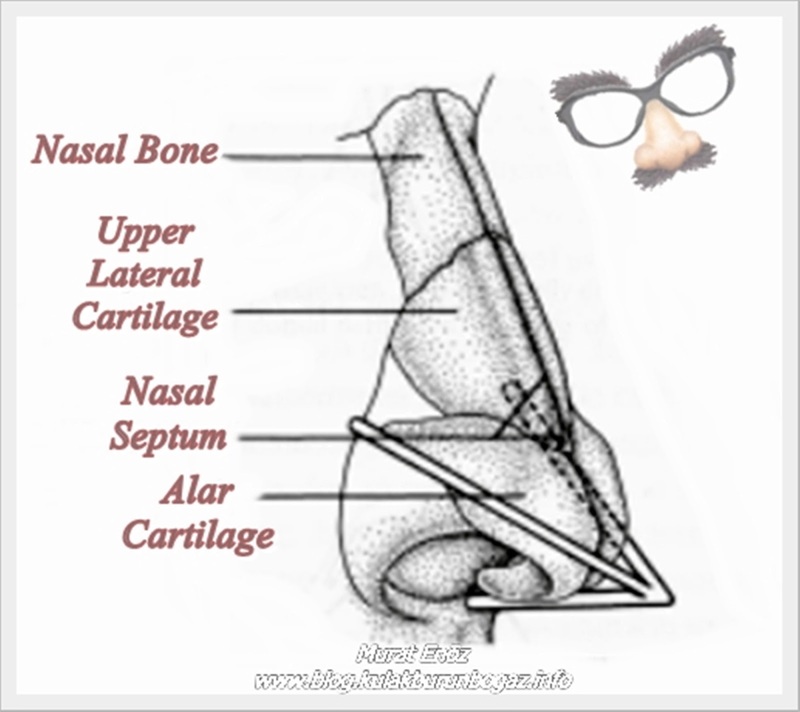 Alar cartilages determine the shape of the nose tip in the form of a tripod. Excessive and sharp exposure of this tripot structure in nasal tip aesthetics may lead to the emergence of a "plastic nose" pattern; Performing excessive interventions on the alar cartilages can also result in the emergence of "tightening nose" or "latch nose". Excessive thinning of the outer legs of the cartilages of the cartilage may cause the nasal wings to collapse inward causing "alar collapse". I wanted to tell you with informative photos that I see on different websites. Many of the famous stars have pre-operative and post-operative conditions on the "Celebrity Nose Jobs: Before and After" website where the photos of Hollwood stars include nasal aesthetics. You can see the findings of "alar kollaps" which is a common condition in the nose aesthetics of the 90s. You may notice that the nasal ducts collapse inwards due to the overload of the cartilage. In 3 pictures, the nose becomes thinner, but if it is thinned more, it will result in a nasal contraction and a contradictory appearance. In addition, if the nose tip support is weakened and this support is not reattached, a fall may occur at the tip of the nose. In the first 6 months after the nose aesthetics, the illusion can be seen in the form of a slight downward direction at the tip of the nose. It depends on the decrease in the post-operative swelling at the nasal tip. Unnecessary cartilage grafts can be caused to unnatural appearance! Adding unnecessary cartilage graft to the nasal tip, unnecessary cartilage removal; it can cause the tip of the nose to come out of its natural appearance and sometimes it can appear under the skin. In order to reduce the nostrils, permanent shrinkage and breathing problems may occur in the nostrils if the alar base resection is done overly. As with all surgical procedures, there are also risks in nose type plastic surgery. Some risks may not be foreseen. For example, healing properties, suture reactions ... etc. In fact, when you pay attention to the nose of the famous names, you can see that there are more or less nasal asymmetry in some of them, some of them have different nostrils, some of them have more scar tissue in the surgical incision areas, or the roughness of the nose type skin. Not all of these problems depend on "surgical error". 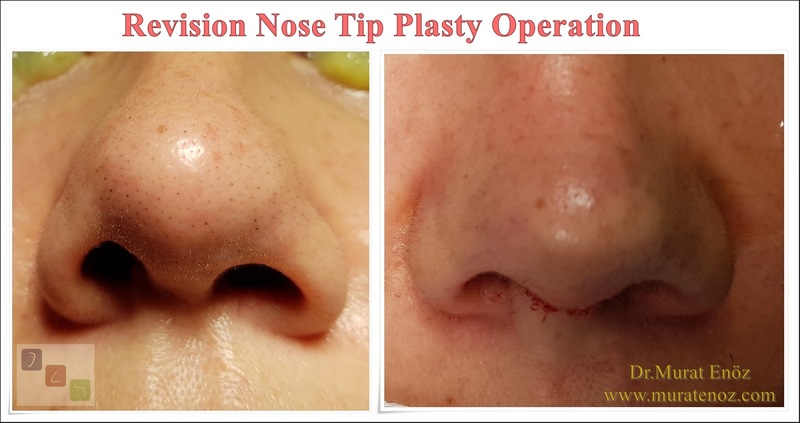 Why Do You Need Revision Nose Tip Plasty Operation? Revision nose tip plasty operation can be planned in patients who have aesthetic or functional nose tip problems after previous rhinoplasty or nose tip plasty surgery and patients who have not had adequate pre-existing aesthetic problems fixed. No results can be guaranteed for any surgical procedure, surgery experience, chance, good healing properties of the patient and good care are combined, the possibility of success is also increased!